Many people have been asking how to start with Rhinoceros. However, people that are familiar with popular CAD software can immediately migrate to Rhinoceros 6 without any problems. However, in order to get the most out of Rhino, people need to know how flexible Rhino is, compare to standard drafting workflow and commands. Rhino can model complex object very fast and very accurate. Accuracy is critical in major field such as engineering, design and even hobby. There are places for you in order to get familiar with Rhinoceros. 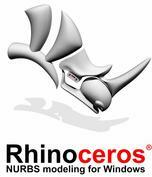 Official Rhinoceros 5 Website. This is the place where you can download the fully working trial version that never expires. But, since it's a trial, it will only save your project 25 times. Differs with some other CAD software that let you learn the software within 30 days, Rhinoceros has no limitation in opening the application. However, when your projects have been saved more than 25 times, saving feature is disabled. But you can keep on opening and learning Rhino, yet without saving. Rhinoceros Community. From this site, you can get updates, news and even tutorials for you to catch up in order to master Rhinoceros. Vimeo Online Video. This site is loaded with tons of video. At the time this page is written, there were 93 videos that you can learn from. The numbers of video will grow along with time. Rhino User Guide web page. Here, you can download the User Guide as PDF and download some models for your to learn on how to use Rhino. So, you need to get yourself geared and start learning Rhino if you don't want to miss the train. If you have difficulties in getting the online Rhinoceros training materials, feel free to drop us a message, and we'll help you shape your Rhinoceros skills and knowledge.